With this post, I have caught up with my SALSA3 meteor data. The plot nicely shows the increase not just in total meteors per night but also the Taurids (the Northern and Souther Taurids are combined in the plot) and Orionids. Note the big jump in rates starting on the night of October 8. The increase is not actually real. After noticing how low rates seemed during September I took my camera system apart and discovered that at some point this summer, the glass in the camera enclosure separated from the housing. As a result rain must have collected on the camera lens. After replacing the housing and cleaning the lens, the number of detections doubled! 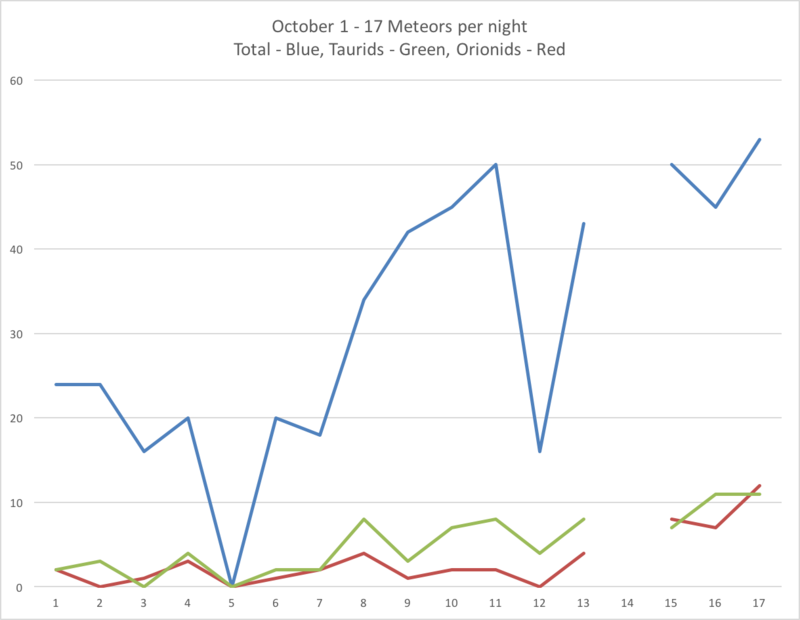 The big shower of October is the Orionids. This year’s will be observable under Moon-less skies. Bob Lunsford of the American Meteor Society has an excellent guide to observing these old pieces of our Solar System’s most famous comet, Comet 1P/Halley.